View Talay 2B. The condominium development is located on the Thappraya road, having easy access into Pattaya City via the baht bus and Jomtien beach is only minutes away. All local amenities are nearby. 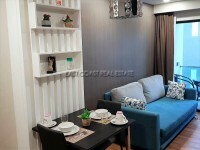 This massive 97 sqm 1 bedroom is on first floor and has been newly renovated to a modern standard. Offering a fitted European kitchen, air conditioning throughout,Open plan lounge and dining areas. King sized bedroom with big built-in closet. Big bathroom with hot water shower. The building has large communal swimming pool, 24 hour security, restaurants, shops, laundry, and ample parking space. Title deed is in Foreign name ownership with transfer fees split 50/50 between both parties. Living area : 97 sqm.